GreenWood, in partnership with Fundación Madera Verde, Dr. Brook Milligan of New Mexico State University, and the United States Forest Service, is coordinating a pilot study of the optimal method for collecting bigleaf mahogany (Swietenia macrophylla) DNA, drawing samples from trees harvested near the communities of Copén, El Venado and Limoncito in the Sico-Paulaya region of Northeastern Honduras. Wood samples from trunks and branches, leaves, and herbarium samples (a stem with two leaves, flower or fruit) have been collected and will be sent to the New Mexico State University genetics lab for analysis, pending approval of legal permits. 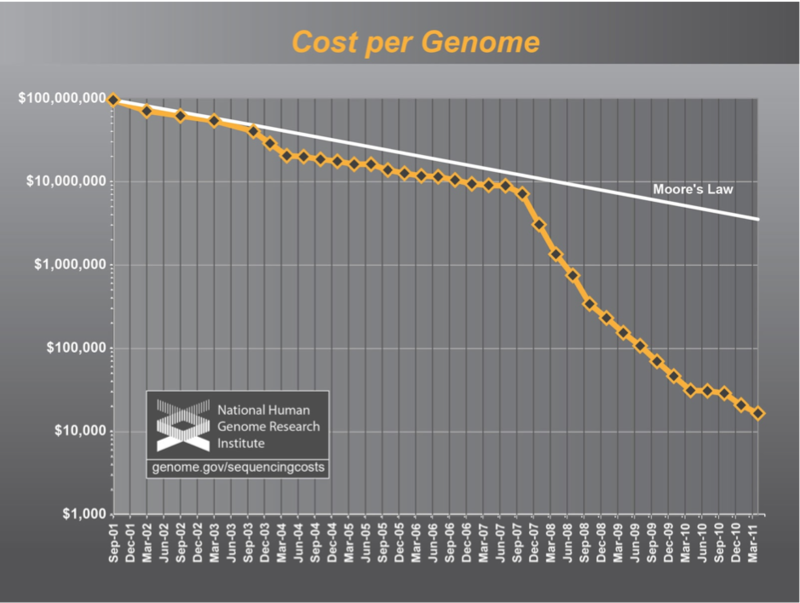 Chart Caption: Price drop in sequencing cost per genome, 2001-2011. Moore’s Law anticipated a precipitous decline in the cost of computer power. Credit: National Human Genome Research Institute.